an American computer scientist and Ph.D. in 2009 on language technology from Carnegie Mellon University under Alan W. Black. Before. he was affiliated with the University of Waterloo, working on fractal compression . 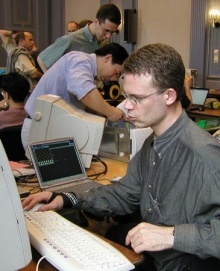 Interested in computer chess, John Kominek is author of the experimental chess program Sharky, a best-first approach which played the WCCC 2002 in Maastricht. He further worked on a revamped version of Nalimov Tablebases, where he found an error in stat file kbpkn.tbs . This page was last edited on 27 February 2019, at 15:46.